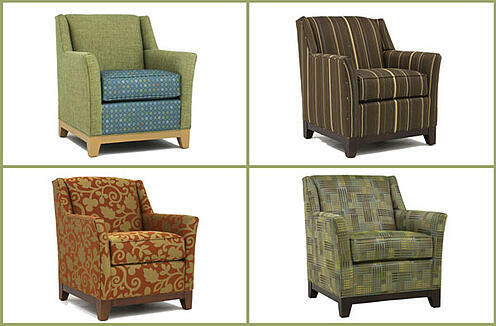 PERSONALIZE YOUR SEATING...WITH THE DURABILITY YOU NEED! When tasked with buying seating furniture for your healthcare or group living facility, the choices available for upholstery fabric can seem daunting. The trickiest part of the ordeal is imagining the finished product. Internet shopping has done a great service in leveling the playing field when it comes to shopping for standard items like folding chairs. But when you want to personalize a sofa or make a lounge chair fit an existing décor, what you see on the internet might not be exactly what you want. The word “custom” can send chills down the spine of anyone working within the confines of a strict facility budget (and let’s face it, who’s not?). The good news is that personalizing your furniture pieces can be less expensive than you think. For starters, most contract furniture companies offer a variety of “in-line” fabrics which basically means fabrics are grouped into one price category for your shopping convenience. Surprisingly, the vibrant pattern you have been eyeballing might not be any more expensive than the boring solid that the sofa or chair is pictured in. Really, the bottom-line price of most contract upholstery in your favorite pattern can be surprisingly reasonable. For the most part, production is factory-direct so which fabric you choose might have very little impact on price since the piece was going to be made-to-order to begin with. If you are offered limited fabric choices by a contract furniture provider there is a good chance you are dealing with a lower quality import that was mass-produced in a few colors. Buying a piece like that may quickly re-affirm the “you get what you pay for” motto. So, check out your options and dream. Sometimes it helps to look at a contract furniture provider’s customer or installation photos to help get an idea of what finished options look like. In general, bolder solids on a seating piece with straight lines lends a more contemporary look while soft patterns on seating pieces with curved backs and arms might look a little more traditional. The sky’s the limit. When in doubt, work with a contact furniture provider who offers the type of advice you need to make your project a knock-out.